I’ve been thinking I should rename this post “when good crafts go bad!” Why? Read on…..
I’ve been on the hunt to find some nice glass pieces as I’ve had some etching cream languishing in the cupboard for a year or more. My last etching project was time consuming and involved printing, tracing and an exacto knife. I hoped that by using my cutting machine this time, I could whip out this project in no time. I was thrilled when I found a cool square bottle with rounded corners for only $5.50! My next task was selecting which font to use for my design – there’s so much choice. I used this free program to help me decide – you just type in a word and scroll down to view it in every font that’s loaded on your computer. Excellent – you can see quickly which fonts look good and which ones to ignore! I chose Meninblue (see below) – I thought that at first glance it would look like a graphic but that on second look you’d notice that it was actually a word. That was the plan anyway! As you’ve probably guessed my word of choice was “Hydrate”. The cutting went well, my Silhouette behaved itself. Here’s the cut vinyl alongside the bottle. I applied the vinyl to the bottle – I wrapped the word around a corner – doesn’t it look cool? I applied the etching cream – all went well – no pic of this though! I cleaned off the etching cream – this is where things started to go downhill – things not going so well now…..LOL! It hadn’t made a mark on the glass! Not one bit of etched glass at all. First I thought my cream was “off” but I put some on an old glass spice jar and that etched just fine. I concluded that my cool glass bottle was some kind of weird uncool un-etchable glass. Oh well, Chalk this one up as an epic craft fail! So I went to plan B, or rather I made up a plan B. I found my left over frosted vinyl from my Mirror project and used that instead. Thankfully, this worked out OK, so I do have a finished item to show you – it’s now a vinyl project instead of an etching project! By the way, I didn’t switch bottles for a blue glass one, I just popped food colouring in the water to make the frosted vinyl show up better in the photo. Here’s the Silhouette Studio cut file. This post is part of “The Silhouette Challenge” where fellow bloggers participate in a monthly challenge to create a new project with their Silhouette Machine. Please check out the links below to see what everyone else has created in the past month. So sorry to hear the etching didn’t come out. 🙁 But you salvaged it very well! The food colored water is a great touch for the photo. Thanks for sharing! Thanks Kristy. I just couldn’t get a decent pic until I tried the food colouring. It did the trick! I know all about having to come up with a “Plan B” – more times than I care to count! Your “Plan B” turned out perfect! I love that font for this project. Thanks Jeanie, Where would we be without plan B? LOL! I have another project coming up with that font too! iIt’s a beautiful creation ! Well, despite having some difficulties, I think your project turned out great! I love the font, too – very cool. Thanks Kirsten, I love the font too. Perfect for the shape of the bottle. I love the font that you chose! It looks really cool, especially with that blue water in it. Thanks Jessica, may hunt down some real blue glass to try out. Boy have I been there!! At least the vinyl stuck, and your final product came out great! Thanks Dee. Yes, I was lucky the vinyl behaved itself. Thanks Randi. It worked out in the end 🙂 I’m using it now as a water bottle but not blue water LOL! So, I”ve been wanting to try etching, but I’m afraid to LOL! I think your bottle turned out cute, though. Would you try etching again? Or no? Give it a try Carrie – I’m not deterred 🙂 I’m definately going to do some other etching projects! Way to come up with a creative solution to a potential craft fail! (I love frosted vinyl, by the way…so I still consider this a craft win!) You know, I have heard that some glass is un-etchable. In fact, I heard that about Pyrex, but was pleased to find that the Silhouette brand etching cream managed to work its magic on it. So, don’t give up on that itch to etch, Pam! Hopefully you can find the opportunity to etch more glass in the future – – maybe for holiday gifts? That’s my plan this year! Etched glass casserole dishes for everyone! Thanks for participating in this month’s Silhouette Challenge and for inspiring us with your creativity! Thanks Lauren, Yes, I was lucky I had the frosted vinyl on hand to save the day. I’ve seen your casseroles and think they are great idea for gifts! I’m definately going to etch other things soon. Way to make a beautiful project out of a craft fail. I’m looking forward to trying to etch with my Silhouette, but I guess I need to be careful what kind of glass I’m using! Thanks Rachel, Yes, I hope to have more success with my glass choice next time. It’s weird really, but i think most glass is Ok.
Way to go! Your vinyl bottle turned out beautiful! Nice font and great work. This is really a great idea. Thanks for the bottle source. Thanks Lynne. I have more plans for this font! I’ve been too chicken to try the etching cream. Surprisingly enough, this post still inspired me to give it a shot… eventually. I love, love, love the font you chose for your bottle and I still think it turned out beautifully! I had no idea there was frosted vinyl so I learned quite a bit. ha! Thanks Janice, The actual etching part is the easy bit., so yes …give it a shot! What a great save with your frosted vinyl! Your water bottle is so classy….I absolutely LOVE it! Thanks for the inspiration AND for giving me an idea of how to think outside the box to save a project! I love how you showed the other one not working. I have had so many plan B projects to count! It still turned out lovely and I love the font you choose! Thanks Tori, It all ended well -I do have plenty of other fails that I’ve kept hidden though! I don’t know how its possible, but your fail turned into a stellar piece, you should be proud!! If only my fails could be turned around. The blue is simply gorgeous and I particularly love how the words wrap around the square part of the bottle! thanks Trisha, The standard is pretty high this month – all fabulous projects on the Challenge. Thanks for your kind words. Don’t you know that some of the best inventions were “mistakes”. Google it! The final product is very awesome! I am so sorry to hear you had etching troubles. I wanted to try etching this time also, and ended up with something totally different also, so I know about making up a Plan B too. That font you chose is perfect for your project and the frosted vinyl is a new one on me. Didn’t know they had it. Love that color of blue for the water too! 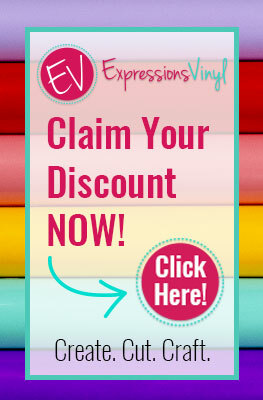 Makes your frosted vinyl show nicely in the photo!! Love it all! Hi Bev, Thanks for your kind words. I think it’s so funny that we both started off planning to etch a word on glass then both had to find an alternative! Ha Ha – what a coincidence – Love how your project turned out too!